Chérac was named after a roman: Carius. Many inhabitants are wine growers. Vineyards are mainly in the 'Borderies' and wine are used in the manufacturing of Cognac, Pinaut and other spirits. 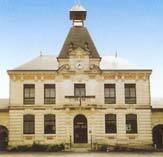 The newly renovated Town Hall, next to La Pantoufle, was built in 1905. It was buit in the late 12th century and was hardly damaged during the '100 years war' between France and the United Kingdom. 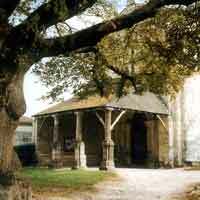 Le portail extérieur est un morceau d'architecture romane abrité par un auvent. La maison de la gaieté. From 1937 to 1952 this village house facade was decorated with millions of pieces of chinaware by Mr Villéger and his son. Above the door a date is engraved: 1792.